I finally got the houses down and washed. The gourd rack is laying dejected on its side awaiting the final touched before being hoisted in to the garage. I am leaving all aspects of the rack intact except to place garbage bags over each individual gourd and taping it so that no critters can get in…or our for that matter. I am already on Google earth deciding where the next rack unit will go. Of course I have to decide what kind of rack I am going to go with. I am relatively sure it will be a gourd rack. But I may be swayed. I will let you know. As always you can visit PurpleMartins-R-Us.com for the largest selection of Purple Martin themed gifts, art, apparel and more coming everyday. Check us out! I have also uploaded my art at imagekind.com by request. Now my art work is available with rich color duplication and archival inks. The prices are very competitive with great quality. They look like true art reproductions-not color copies. Check them out. It’s important to note, that there are other birds that look VERY similar to HOSPs. Remember, Non-native HOSP will enter a cavity and destroy eggs, young and adult native birds. The only other bird that will destroy eggs is a native House Wren. 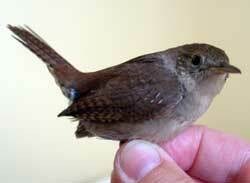 House Wrens are smaller, have a long pointy beak(NOT a fat conical beak), tail often held upright(Not held down). They Have NO BLACK bib. They have a drab grayish- brown, belly. House Wrens are native and are protected. It seems like a lifetime ago. When I used to work…when my days were filled with the smell of antiseptic, not my baby’s diapers. When my thoughts were of what life threatening emergency needed thwarting, not who was teasing whom. ANYWAY, Many of my friends know of my “Purple Passion”. They joke and say it is what has kept my mind sane-not that I would say I was sane before having kids…hmmmm. An old nurse friend, who works at a local “nursing home” told me of a man that I may be interested in meeting. She told me of a man named Jose who talks in broken English and curses at the other residents if he sees them throwing breadcrumbs to the birds in the courtyard. I laughed, knowing instantly that I liked him already. Any enemy of English House Sparrows is a friend of mine! The old smells and sounds of a nursing home never change. My friend brought me to the courtyard where she introduced me to Jose. He sat in a wheelchair next to a concrete bench under a large tree. We talked of nature and Purple Martins. Lost family and new friends. He would occasionally “shoo” other residents away. He would say, ”That one always feeding those $&!# birds!” He is a fairly slender man who looks younger than his age. His hair is still mostly dark with one large gray patch on the side. He says he was born in 1920 but he admits that his medical records say he was born in 1924. Either way that makes him between 88 and 84 years old. I was surprised at the sharpness of his mind though he speaks mostly Spanish (which I do understand) and Portuguese (which I do NOT understand) His English is broken-which he speaks to others, but with an almost embarrassed, self conscience manner. Born in Argentina, his parents moved to Brazil at some point when he was a young boy. His parents being Argentinian explains his excellent Spanish. His Portuguese was picked up while he lived in Brazil. He told me of how he first found his love of Purple Martins…or the, “Golondrina”. Of the first time he heard their song and saw them flying. He was walking somewhere with his mother. He was somewhere around 6 or 7 years old. He saw ”a cloud of swirling life” in the sky as he walked and was amazed. He had never seen so many ‘bats’. His mother told him what they really were. “Golondrinas” or Swallows. He thought they looked like angels playing and he would watch them until he became dizzy-staring up in the sky. I will post more of my meetings with Jose ASAP! And thank you all for your interest. I have to always make sure that I am specific when I refer to English House Sparrows. 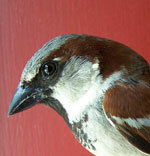 There are several birds that look like HOSP (English HOuse SParrows) but are not. I will cover that subject on another thread! There are several popular courses of action that can be taken to protect your martins (or Bluebirds or Tree Swallows) from HOSP. All of them are better than letting the HOSP successfully rear young. Let’s tread gently, as to not offend anyone. 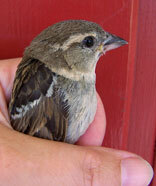 Many people have a problem (initially) when they think about euthanizing a bird to protect a bird. It may seem counter-productive at first. Also keep in mind if you choose to use non lethal ways to control sparrows, you risk Sparrow Rage. A deadly behavior that HOSP exhibit when their breeding cycle is disrupted. 1. Stop feeding cheap bird seed. What type of seed you offer should be dependent on your area and what kind of native birds you get. There are many options for bird food that natives prefer over the inexpensive seed mixes that contain large amount of millet (proso millet). Do not feed bread. Offer seeds like sunflower (black oil) or thistle, again depending on the natives. Woodpeckers love peanuts (whole). Trim the perches on your bird-feeders so that the HOSP can not perch on them (5/8 inch) but natives will. Use upside down feeders for birds like goldfinches. There are also woodpecker specific feeders that encourage clinging and are very HOSP unfriendly. There is a device that can be used to deter HOSP from your feeders, like a “Magic Halo” see photo at top of page. Some people have reported that placing a bird feeder inside of an upside down bucket with the handle hanging down, will deter HOSP from entering up into the feeder. If all else fails, consider removing your feeders. 2. Do NOT allow a HOSP to nest in a nest box. Remember, every HOSP will kill a native bird, if it has an opportunity. There are several things you can do. These work very well if you do not have martins at your site yet. Pull the nest material out as often as they fill it up. Do this daily, if need be. Plug the entrance until the HOSP find somewhere else. 3. TRAP, TRAP, TRAP! What you do with the sparrow is up to you. (It IS a free country) The best solution is to euthanize the HOSP. If you have issues with euthanizing some other non lethal approaches have been tried. After the sparrow is trapped, you can trim their wings. Its like a haircut. Not painful at all and will grow back. If you trim one wing the bird will usually fly down in a circle. Clipping both will usually make the bird able to navigate a bit better as it will have equal forces of thrust on both sides. Though achieving any altitude will be difficult. You can trim the tail feathers also. The purpose of the wing trimming is to focus the birds energy on survival rather than breeding. An important note is that relocating the HOSP is NOT an effective way to control them. Besides spending a ton of money on gas, the sparrows will return before you do. Besides, the relocating of your problem to another area may well spell death to a native bird in that area. Your initial conscience saving action will only lead to the death of countless other birds, other than the one you just spared. There are sparrow traps that use food as a bait. There are also several different sparrow traps that are put within the nest. What is Sparrow Rage? Basically when the HOSP breeding attempts are interrupted the sparrow will enter other cavities and will destroy whatever eggs, young and adult birds he is able to. No one is exactly sure why they do this. As many other birds do not do this. We can only assume it has to do with decreasing competition for nesting sites and to better insure the next clutches survival. You can be assured that English House Sparrows will be actively causing destruction whether you witness it or not. There is no such thing as Martins and Sparrows “getting along” Your colony may achieve a temporary equilibrium where a few martins can raise some young along side with HOSP. 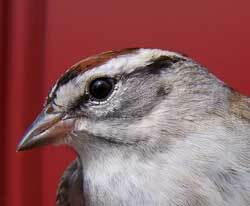 BUT if sparrows were aggressively controlled the numbers of martins at your colony would increase substantially. Always keep in mind, doing something is always better than doing nothing. Many people describe initial hesitance with euthanizing the HOSP but after they witness the destruction, many conclude that they have to be a bit more proactive and when they do, they are glad they did. These people will all attest to the increase of martins at their sites. July 11, 2008 English House Sparrow Blues! Next posting will cover ways to control HOSP. I Thank Sialis. org for there wonderful info and link. A whopping 3 Martins on the wires for less than 5 minutes. That was it. I have been thinking a lot about Owl Protection for next year. I have several options…and so do you. I strongly encourage all those that do not have predator protection in place to give it some thought. The work that Purple Martin Landlords go through to attract these birds is significant. The damage an Owl can do over the course of a few nights is devastating. With a few simple deterrents you can save the lives of many martins. Its amazing the animals around us that we are not aware of. We look out our windows or get out of our cars and we have no idea the eyes that are watching us. I did not think there were that many Owls out here where I live until I spoke to a nice man at the local grocery store. He proceeded to tell me of the 4 nest boxes he had on his property…about 2.5 miles from me, that fledged baby Horned Owls every year. I was amazed since I figured that since I had never heard “hooting” that there were no Owls. WRONG! I have read many a posts from landlords who lost their entire colony to some predator or the other. Purple Martins just don’t pick up and leave. Something drives them away. Be it snakes, raccoons or Owls (to name a few) There are creatures rooming around in the dark scouring the neighborhood for an opportunity. And trust me, being 15 feet in the air is not protection. 1. ENLARGE THOSE COMPARTMENTS! 6×6 is so 20th century and so unsafe. 6×12 is the way to go. A simple feat to enlarge existing compartments. Some housing systems (Like Quad Pods) use a baffle to deter Owls. That is simply a plastic barrier, withing the compartment that prevents the owl from seeing past it and into the compartment itself. 2. USE TUNNELS! The tunnel can work like a baffle in some respects, preventing the owl from seeing all the way in the compartment. Mainly the tunnel makes it difficult for an Owl to reach in and pull out birds with his talons. An Owl can reach all the way in a 6×6 compartment and pick off every last bird. With a tunnel, the birds have some measure of safety. 4. WIRE ME UP! 3″ x 4″ hardware cloth or ‘chicken’ wire can make a great owl guard. Wrapped around the housing, the martins will quickly learn to navigate the wire and have a safe escape if an Owl comes calling. You can also purchase Owl Guards that are made specifically for your housing that wraps around it-serving the same purpose. 5. LIGHTS ! Many have found that flood lights, either on all night or motion activated can somewhat deter Owls. Apparently the lights can spoil an Owls stealth approach. My philosophy is-every little bit helps. I have been working hard on the website. New Purple Martin Polymer jewelry has been added as well as some beautiful Swallow apparel. 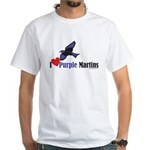 Check it out http://purplemartins-r-us.com. July 4, 2008 Happy 4th of JULY! I just wanted to wish all of you a safe and happy 4th of July. My kids are looking forward to the fireworks. I took the house down and have yet to give it its final wash. It sits in the grass as a lonely testament to the martins departure. I remember last year I was so worried about the house as I still had babies in a nest. I was worried that the mother would abandon them from all the smoke and fireworks that goes on out here. Thank goodness we have had alot of rain. No need to worry about wildfires this 4th…or what the martins will think. Speaking of Purple Martins. I saw 1 today. A lone martin on the wire for about 5 minutes. Then he was gone. I am being over run by Grackles. They are trying to eat me out of bird seed. A faithful pair of cardinals tries to wait their turn at the feeder, the 1 fledgling they bring is so ugly…but cute. I chase the grackles away and that buys the cardinals a minute or two before the grackles return. The baby cardinal begs relentlessly at the feeder only centimeters away from seed. The male parent hulls the seed and stuffs it in his beak. So cute. Mr. Roberts tells me that only a few dozen Martins are returning to the Davie roost. Twenty centuries ago, in Nazareth, the Child Jesus, while playing with his friends, made some delicate bird figurines with clay from a nearby creek. While they were playing a Pharisee who was passing by started screaming at them: “Don’t you know that today is Sabbath day and you are not allowed to do any type of job?” Immediately he tried to squash the figurines with his foot but Jesus extended his hand and the birds began to fly. That is the way swallows were born. These same swallows later made their nests on the roof of Jesus’ home. Many years later, when Jesus was already a man and was on his way to Golgotha, the swallows were desolate as they followed Him. The Teacher was going to die and a stream of blood mixed with tears was running down his face. The little birds then, one by one, took the thorns of the crown off the magnificent face. At that moment the Earth trembled and the sky was clouded over. From that day on swallows acquired the mourning cloak that they still carry.